After weeks of hype and speculation, the Toronto Maple Leafs unveiled their new logo last night. Reviews have been somewhat mixed, but the response among fans seems to have been largely positive. That's good news for the franchise, which spent months working on the logo in a series of highly secretive closed-door meetings. Luckily, DGB spies were able to infiltrate those sessions, and reported back with some of the more interesting things they managed to overhear. OK, guys, I'm feeling kind of crazy right now, so just hear me out: What about this time, we try a blue maple leaf with white lettering? Geez, I made one little joke about how the vein at the bottom sort of looks like a mustache and Lamoriello's spent the last two hours screaming at it to shave. So a few ground rules before we start, just the standard stuff from any logo design project: Please be respectful of everyone's opinion, don't leak any prototypes, and anyone who has ever worked for the Buffalo Sabres will be shot on sight. They told us to make sure the logo really augmented the experience of a diehard fan wearing a Maple Leafs jersey to a game, so apparently it needs to be aerodynamic. We really want something the pays tribute to the beloved teams from long ago, those distant eras seen only through the hazes of time, and heard only through the stories passed down from generations past. Or, as Dubas calls it, the 90s. Let's really make sure we get this right, guys. Remember, this logo is the second most important thing we'll be adding to our uniforms this year, right after the Stamkos nameplate. So after doing a thorough review of all the positive moments in franchise history, our conclusion is that the logo should actually be in black and white. We'd hoped to include something that captured the legacy of the Mats Sundin era, but in the end we decided that adding a picture of a Senators fan crying would be too busy. So by a quick show of hands, it's three votes for the classic logo, two for the modernized one and… five for John Scott? Dammit Wyshynski! The press release should have a quote from Shanahan, but it might also be cool to get a historical perspective from the Maple Leafs' longest-serving current employee. So, uh, two quotes from Shanahan. I don't know, I think 31 points is way too many, I'd be more comfortable going with 11 points and … oh, sorry, is the logo design meeting starting? OK, we'll stop talking about the rest of the Habs season. And right here is where we hide the microchip that triggers the self-destruct sequence for anyone who's not back in their seats five minutes after the start of a period. You know, it's going to be a refreshing change to have a small and barely noticeable bum on a Maple Leafs logo instead of the other way around. "I don't know, I think 31 points is way too many, I'd be more comfortable going with 11 points and … oh, sorry, is the logo design meeting starting? OK, we'll stop talking about the rest of the Habs season." Listen, I knew Dammit Pronger. I laughed for a day at Dammit Pronger. And you, sir, are no Dammit Pronger. "So after doing a thorough review of all the positive moments in franchise history, our conclusion is that the logo should actually be in black and white." So sad, but so true! Great stuff! 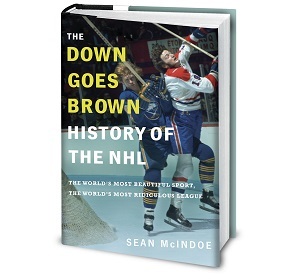 Welcome back to doing what made you the greatest hockey writer this generation has. "Anyone who has ever worked for the Buffalo Sabres will be shot on sight." I just fell out of my chair from laughing so hard. Oh that burn on my Canadiens. A little too close to home. Greta stuff! That last point really got me! Weekend report: It's quiet. Too quiet.